For day 10 of my Post-Christmas gift reviews, I’ll be moving away from the mostly sci-fi based reviews of the last nine days and going back to the subset of action figures I am most comfortable with: Superheroes! Barbra Gordon as Batgirl didn’t appear till the tail end of the original run of Batman: The Animated Series, but all three of the episodes in which she appeared were pretty well-received with both the fan base and the creative team behind the series. When the series came back as The New Batman Adventures, Batgirl was given a much larger role, and in fact appeared in the majority of the show’s episodes. So, it’s not a huge surprise that DC Collectibles’ first figure of the animated incarnation of the character comes from her later appearances. 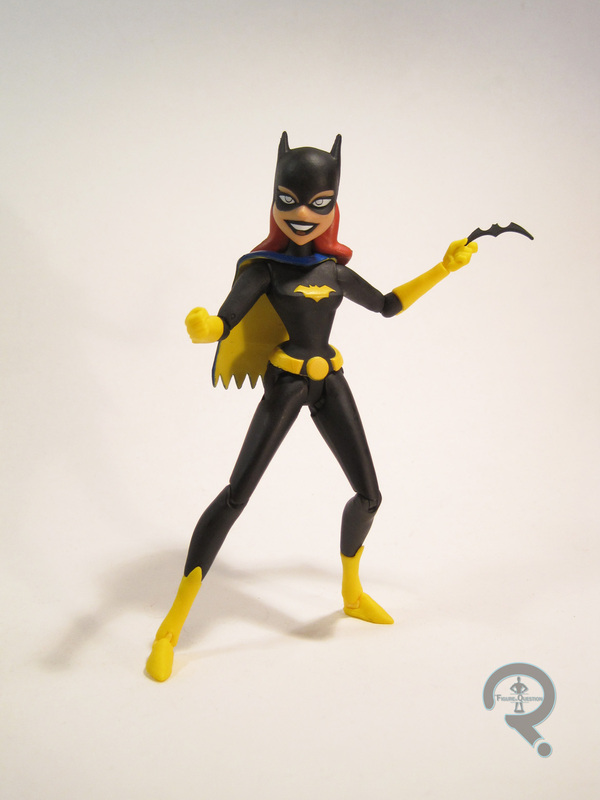 Batgirl was released as part of DC Collectibles’ Batman: Animated line. She’s figure 18 in the line, which places her in the fifth series of the line. The figure is about 5 ½ inches tall and has 25 points of articulation. As I noted in the intro, she’s based on her New Adventures design, which itself is a pretty straight adaptation of her original comics design. The costume has of course been tailored to fit the more stylized nature if Timm’s New Adventures character designs, which includes streamlining of the belt and boots. It’s definitely a solid piece of design work. 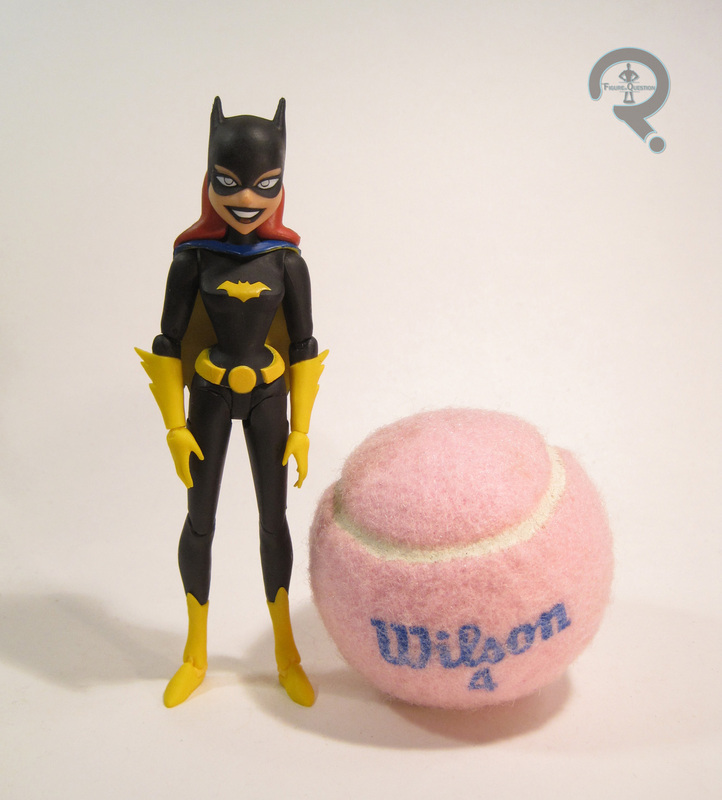 Batgirl’s sculpt shares a number of stylistic similarities with Poison Ivy, due to their builds being quite similar in the show, but it doesn’t appear that the two figures share any actual sculpted pieces. The overall quality of the sculpt is quite good, and she definitely looks like her onscreen counterpart. She also doesn’t seem to have the same huge noggin issues that Ivy did, though that may be to do with her not having Ivy’s rather large chunk of hair. The proportions I general are pretty well-balanced, and the joints and such are all worked in rather nicely. Batgirl’s paint is pretty much on par with the paint we’ve seen on the rest of the figures. It’s a little rough around the edges of her mask, as well as the change from yellow to blue on the cape, but the overall appearance is pretty solid. 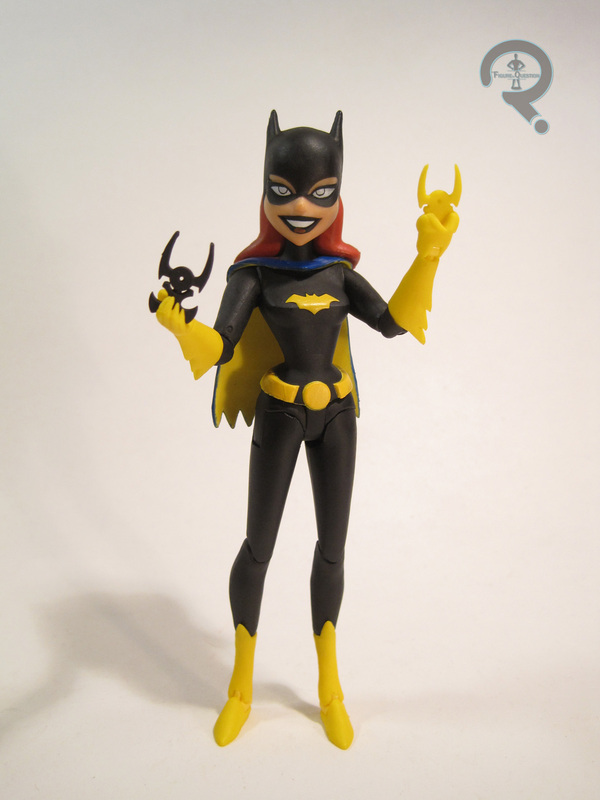 Batgirl includes a batarang, 10 extra hands (2 fists, 2 gripping, 2 loose grip, 2 relaxed, and one for holding the batarang), a bat-grapple, a hand holding the grapple, and a display stand. They’re all pretty good, except for one thing: the grapple on the hand with it sculpted in place is completely unpainted. I don’t know if this is contained to just my figure or if it’s a wide spread problem, but it’s quite obvious and rather annoying. Batgirl was given to me this Christmas by my parents. She was a figure I was quite looking forward to (she and Nightwing were my two favorite characters from New Adventures). Like just about every figure in the Batman: Animated line, she is not without her flaws. However, she’s a pretty well put together figure, and a lot of fun.